Luxury detached villa situated on a small peaceful development of 23 villas, and less than ten minutes stroll to the beach, restaurants, and village centre. 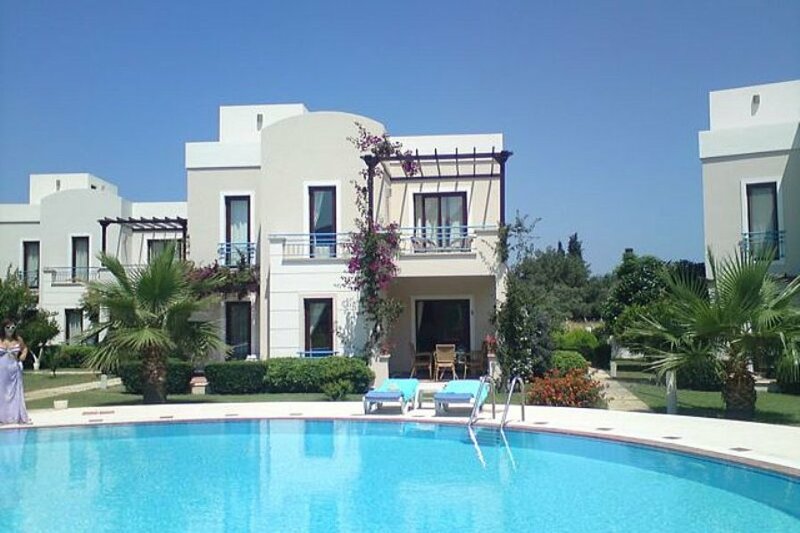 Villa Jasmine is set in beautiful gardens and shares a large pool and separate adjacent children’s pool with the other villas. There is lots of space around the pool to sunbathe, or you can relax in the shade on the terrace whilst keeping an eye on the children in the pool. There is also a spacious roof terrace for sunbathing or admiring the view and watching the sunset. Open plan living room, dining area and kitchen with air conditioning. Downstairs wc. The lounge is comfortably furnished, and has satellite TV, DVD player, and a PS2, plus a selection of DVDs, and PS2 games. There is also an ipod/iphone dock/charger. Dining area with table and seating for 6, and an outside terrace, plus BBQ for al fresco eating. Sun loungers for use in the garden or by the pool, and a garden umbrella. Well equipped kitchen, with oven, fridge freezer, microwave, kettle, toaster, dishwasher and washing machine. Three bedrooms to sleep six people in comfort. All bed linen, bathroom towels, and a hairdryer are provided -please bring your own beach/pool towels. All bedrooms have air conditioning. Master bedroom with super-king sized bed, and an ensuite bathroom with wc and shower. Terrace overlooking the pool and gardens. Bedroom two with single beds, and bedroom three has bunk beds. Second bathroom with rain- shower and wc. Roof terrace with table and chairs. Car park within the complex. The development is gated with 24 hour security. The villa will be cleaned and prepared for your arrival, with the beds made up. Our local villa management company will meet you with the keys. They will call during your stay and will be available to assist or advise you if needed. Check in time at the house will normally be from 3 pm and check out time 10am, but we will try to be flexible about this where possible, to fit in with your flight times. Return transfers to and from the airport can be arranged for you. Yalikavak is a traditional Turkish fishing village offering visitors authentic Turkish life in beautiful surroundings. It is situated on the quieter northern coast of the Bodrum Peninsula. As it remains largely unspoilt it manages to retain its Turkish charm and relaxed atmosphere. Yalikavak has sandy beaches, clear blue waters and a fantastic new marina, where you can take a short evening stroll to admire the super yachts. You can watch the locals fishing for their supper on the harbour wall or sit by the beach with a gin and tonic or a pint of the local Effes beer to watch the sunset over the Aegean sea. The local market is held every Tuesday for food, and on Thursdays has many stalls selling linens, towels, T shirts, jeans and leather bags – all at bargain prices – as long as you are prepared to haggle a bit! The food market is very bright and colourful with stalls selling vegetables, nuts and spices, and a huge variety of Turkish delight. From the town centre you can hop on a dolmus to visit Bodrum or one of the neighbouring resorts, such as Gumusluk, Torba or Gundogan. To the south of the peninsula are the livelier resorts of Gumbet, Bitez and Turgutreis. There are daily boat trips from the harbour, where you can lie and relax in the sun as you sail to secluded bays to swim from the boat in the clear Aegean waters and have lunch and afternoon Turkish tea and cakes. Bodrum is about a 20 minute drive away, with many fashionable shops, waterfront restaurants and cafes and a large marina. A visit to Bodrum’s 15th century Castle, built by the Knights of St John is recommended, as is the castle’s museum of underwater archaeology. From the waterfront in Bodrum you can take a day trip to the Greek island of Kos. Other attractions include a visit to a local Turkish bath or hammam, followed by a vigorous massage. Try a Turkish night, with belly dancing and a buffet of traditional mezes. Further afield you can take a trip to Ephesus – the largest archaeological site in the world, the stunning pools at Pamukkale, the royal rock tombs at Dalyan or the temple of Apollo at Didim. Complimentary Welcome Pack - tea, coffee, sugar, milk,orange juice, eggs, bread, butter, jam, water. For families with a baby/young child a cot, high chair and potty are available. A fold up bed available for an extra guest. Free site wifi. The pool is open from 1st May to 31st October.